Case 1. 42 yo female presents with cough, fever, and tachycardia. Pt had pneumonia on CXR and CT imaging, no PE. Patient also had afib, a low TSH and a goiter. Diagnosis was thyroid storm and pneumonia. Critical actions: Treat with propranolol, methimazole is preferred over PTU due to PTU’s risk of hepatic failure, SSKI given at least 1 hour after methimazole, and glucocorticoids to block peripheral conversion of t4 to t3. Andrea comment: give dexamethasone or hydrocortisone as your choice of steroid. It has somewhat better activity than prednisone or solumderol. Christine comment: Don’t give CT contrast to a person with hyperthyroidism who has not received PTU or methimazole because that will actually ramp up their hyperthyroidism and potentially move them into Thyroid Storm territory. Also don’t give two AV nodal blockers to a patient. Giving a CCB for Afib and following that with a Beta Blocker for thyroid storm could cause severe hypotension or bradycardia. If you figure out the patient has thyroid storm after you initiated treatment with cardizem for Afib maybe give esmolol because you can turn it off if you get into trouble. You can also just use cardizem for rate control as this is the recommended agent for treating storm in patients with bad asthma. Case 2. 56 yo female with acute headache. Pt has difficulty with vision in right eye. Right pupil is midrange and non-reactive. Right eye pressure was 60 mm hg. Diagnosis is acute angle closure glaucoma. Critical actions: Alpha agonist (Brimonidine), Beta blocker (Timolol), Pilocarpine, Acetazolamide, Mannitol, topical steroid, emergent ophthalmology consult. Girzadas comment: Good mnemonic is E=M2C or Eye=miotics (pilocarpine, beta-blocker, alpha agonist), mannitol, and carbonic anhydrase inhibitor. It doesn’t cover the steroid but for test purposes if you know the miotics, mannitol, and acetazolamide you will pass. Case 3. 16 yo male with Right hand pain due to punching another person in the mouth. A day or two has passed since the trauma and patient has signs of wound infection. Patient has a fight bite over the 5th mcp joint. Xrays are negative. Critical actions: Copious irrigation, IV unasyn, get xray to look for fx/fb, emergent hand consult. Human saliva has multiple organisms including strep, staph , fusobacteriumand eikenella corrodens. Harwood comment: Tell the patient and family that the patient has a really bad problem that can lead to severe disability. I prefer to admit all these patients. Don’t ever close a fight bite primarily. Splint the hand. 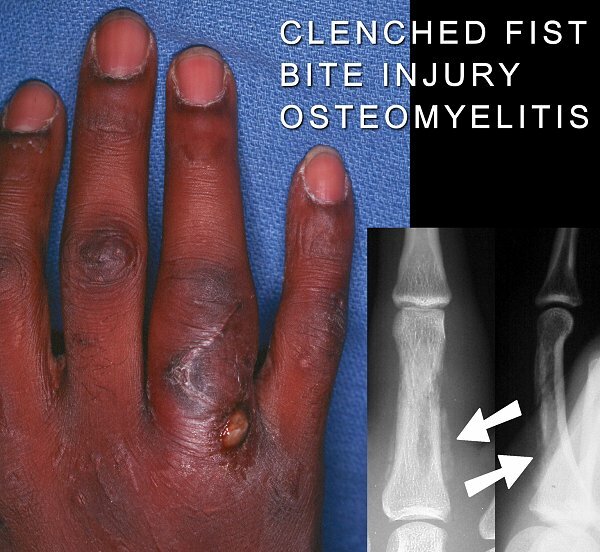 Google Image of Fight bite/Clenched fist injury with resultant osteomyelitis. Finger had to be amputated eventually. Clenched-fist injuries, also called “fight bites,” are notorious for being the worst human bites. Inadequate initial management leads to significant morbidity. Misleading history, innocuous wound appearance, intoxication and lack of cooperation of the patient leading to inadequate examination, patient reluctance to admit the nature of the injury, delayed presentation, and inadequate exploration all may lead to mismanagement. Clenched-fist injuries are associated with the highest incidence of complications of any closed-fist injury and of any type of bite wound. The classic injury is a bite wound over the third MCP joint, but injury can occur over any joint. Soft tissue injury is apparent with possible extensor tendon injury and violation of the joint capsule. When the fist is subsequently opened, the bacterial inoculum is dragged with the extensor tendon and soft tissue proximally into the dorsum of the hand. Presentation may be acute or delayed. Swelling, limited range of motion, erythema, and pain out of proportion to the apparent severity of injury are typical findings. Pain is more severe with range of motion. Aggressive management is indicated with these injuries. Immediate consultation with a hand surgeon is advised. Analgesics, irrigation, tetanus, cultures, intravenous antibiotics, appropriate wound care, elevation of the affected limb, and hospital admission should be considered for all patients. Foreign bodies are excluded with radiologic studies and possibly exploration. Tendon injuries are ruled out with careful exploration. The hand should be splinted in the position of function. Pathogens usually are polymicrobial, with Staphylococcus aureus, streptococci, and anaerobes the predominant species. Multiple-drug regimens are recommended; amoxicillin-clavulanic acid or penicillin with a first-generation cephalosporin is commonly used. Crew Resource Management (CRM): Method of communication and team work utilized by commercial and military aviators as well as our anesthesia colleagues to minimize errors and maximize patient safety. Key aspects of CRM are the leader sharing his mental model of the problem at hand and his plan for addressing the problem with all team members so there is a shared vision. Clear communication using repeat-backs and clarifying questions and phonetic and numeric clarifications are the other key aspects. STAR=Stop Think Act Review. This is a CRM tool to slow down when there is time pressure and be sure the action you are preparing to take is correct. An example would be to stop and review the patient’s allergies, PMH, Chief Complaint, and current clinical condition prior to ordering a medication. CLER visit is happening April 29th and 30th. CLER=Clinical Learning Environment Review. This is basically the RRC coming to see how the hospital is training residents. They focus on the areas of error reporting, patient safety, hand-offs, fatigue management, quality, and duty hours. Feiba is essentially a 4 factor prothrombin complex concentrate (factors 2,7(activated),9,10). It has smaller volume and faster/more reliable correction of INR than FFP. On the downside, FEIBA has prothrombotic properties. Median time to INR reversal to less than 1.5 was 47 minutes. 93% of patients achieved INR goal of less than 1.5. Mortality for FEIBA patients was 39.5% 14% of FEIBA patients had thrombotic adverse events. 1 patient accounted for ¾ of all thrombotic adverse events. The mortality rate for FEIBA is higher than the mortality rate for patients receiving FFP in our Medical Center. However, analysis of the data shows that patients receive FEIBA very early in the hospital course (in the ED). Patients who got FFP received it much later in their hospital course due to the time it took to prepare FFP. Thus the severely ill patients who would have received FFP died before receiving it. Severely ill patients receiving FEIBA were still alive in the ED to get the drug but still die in the ED or early in their ICU stay. Patients who lived long enough to receive FFP were less ill and more likely to survive. This survivor benefit for FFP likely accounts for the difference in mortality between FEIBA and FFP. Medication errors are the single most preventable cause of patient injury. They accounts for 25% of litigation against physicians. 77% of medication errors in the ED occur between the order phase and administration phase. Multiple factors contribute to med errors: unfamiliar patients, multiple patients, interruptions, verbal orders. Verbal orders are more prone to error than written orders. Closed loop communication: Sender gives order, receiver performs a read back or call back of the order and sender confirms order. This three part communication is part of Crew Resource Management discussed above and has been shown to decrease the rate of miscommunication. If patients are in the ED for a prolonged time, they frequently don’t get appropriate repeated dosing of medications. Most common type of medication error is physician ordering error. Avoid trailing 0’s when writing dosing. Example to avoid: 1.0 mg of dilaudid could be misread to be 10 mg of dilaudid Standardize concentrations and dosing as much as possible. Double-check dosing . For home medications, it is considered best to have one person administer the medications for a patient to avoid errors. It is also considered best to as much as possible have one physician be prescribing medications for a patient . Girzadas comment: When you are asked to give a phone order for an ED patient who you haven’t seen for a few hours and you are caring for multiple patients, STOP and regain situational awareness of that patient by reviewing their allergies, medical history an chief complaint. Regaining that situational awareness of the patient will help prevent medication errors. This is the STAR technique noted above.